Although Guyana has been without a Commissioner of Information since March 2018, the Government was yesterday ordered by Chief Justice Roxane George to provide the office of the commissioner with staff and furniture, so as to ensure its proper function. Sacked Commissioner of Information Charles Ramson Sr., whose termination was announced in December last year, filed litigation against the Government arguing that he was unable to execute the functions of his office having been deprived of having the appropriate accommodation, staff, machinery and equipment. Having reviewed the evidence, the Chief Justice ruled that the Government’s action was in violation of Section 5 of the Access to Information Act 2011. And that there was no evidence presented by Prime Minister Moses Nagamootoo and Attorney General Basil Williams, who were listed as joint respondents in the matter, failed to provide otherwise. Sharing his comments after the Chief Justice’s ruling, Ramson said, “Nagamootoo failed to provide any evidence that the appropriate provisions in Section 5 were complied with. In relation to Ramson’s appointment, the court said that issues regarding his termination of employment whether lawful, constitutional or not, will not be dealt with in these proceedings, since it will serve to complicate a straightforward issue. In this regard, a Notice of Application filed by Ramson challenging his termination was refused. Nagamootoo had said, “He (Ramson) has rendered no report to this National Assembly; has provided no account of what he has done”. Further, Nagamootoo had related that the Government and Ramson are before the courts in a “series of litigations” for monies, which the commissioner claims are owed to him. 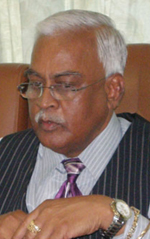 The Prime Minister had also said that the office of the Commissioner of Information is being “re-examined.” Ramson was appointed to the post in 2013 by then President Donald Ramotar. It was reported that Ramson was paid $1,418,000, along with other benefits to ensure that every citizen have easy access to information. While it was only announced to the media that Ramson was sacked in December 2017, Ramson was relieved of his duties since March 2018, but continued to receive his full salary. In January 2017, Ramson sued the Government for a little over $5.5M in unpaid gratuity for December 2016, along with payment for the use and occupation of his property at East Street, Georgetown after government failed to provide him with suitable accommodation for his office.